I suspect "Uncle Sam" was born July 4th, 1776. If so, he was still a young man, only twenty-eight years old, when Osceola came into the world. The Red Stick tribe of the Creek Indians had a camp on the bank of the Chattahoochee. The water of this river is colored by the roots of trees, shrubs, and vines which grow along its sluggish current, and so it is very black. Osceola's mother, living near this dark river, named her baby As-sa-he-ola,—black water. Spanish tongues by and by shortened it to the beautiful and Latin-like name of Osceola. Osceola's mother was the daughter of a Creek Indian chieftain. His fathers is said to have been an Indian trader born in England. There were three children, two girls and the boy. Osceola's mother, the proud and high-tempered Indian princess, became angry for some reason and taking her son went into the wilderness of southern Georgia and joined her own people, while the father took his two daughters and passed over to the far West. The princess taught Osceola both English and her own language, but she had come to hate the white people and did not fail to bring up her son with the same unkind feelings. After a time troubles arose between our white settlers and the Creek Indians in Georgia, and Uncle Sam sent General Jackson with an army to drive the Indians further South. At this time Osceola was only fourteen years old; yet he was so smart and so fierce that he became a leader of his people. Under him they fought hard, and were driven at last to the middle of Florida, where, not far from one of Uncle Sam's stockades, called Fort King, the tribe joined the Seminole Indians, who lived there. These Florida Indians, the Seminoles, were really a part of the Creek nation and spoke almost the same language. They soon became fond of Osceola, and as their head chief, Micanopy, was very old, in all fighting Osceola became the real leader. He had two under-chiefs, one named Jumper and the other Alligator. They were as fierce and hated the white people as much as he did, and enjoyed doing all he told them to do. As Osceola grew older he had a fine, manly bearing and a deep, soft, musical voice. He quickly learned a new language, and he was very skilful in the use of the bow, though he liked better the white man's rifle with powder and ball. It is said he always hit what he aimed at. For fifteen years Osceola went from tribe to tribe and from chief to chief all over Florida and other states of the South, wherever he could find Indians. He always spoke against the white people, saying they were two-faced and would not treat the Indians with justice and mercy. I believe that Uncle Sam really had a good feeling for his red children; but the white people were very few in Florida, and they were afraid of the Indians and wanted to send them away to the West. So they asked Uncle Sam to send his officers and agents to make a bargain with the red-men. This bargain came about and was culled the "Treaty of Payne's Landing." It was signed at Payne's Landing on the Ocklawaha River May 9, 1832, by some of the Indian chiefs and by Uncle Sam's white officers and agents. It was agreed that all the Indians were to go far away beyond the Mississippi River before the end of the year, and that Uncle Sam should give them $3000 each year and other things which were written in the treaty. Only a few of the Indians really agreed to go, and Osceola, now twenty-eight years old, was very much against giving away the Seminole country. He aroused the whole nation, nine tenths of the head men were with him, and he gathered good warriors, divided them into companies and drilled them. Osceola called an Indian assembly, and rising to his full height (5 feet 8 inches), took a strong bow in his right hand and an arrow in his left, and said, "I will not sign a treaty to give away the Indians' land, and I will kill the chiefs or any followers who sign it." Two years, Passed, and then some Seminole chieftains, who had gone beyond the Mississippi, returned. They reported against removal of the Indians, and the Indian Agent called a meeting of well-known Indians and white men to talk it over. The old chief, Micanopy, spoke for the Indians, but Osceola sat near and whispered into his ear what to answer the Indian Agent. Micanopy was old and wanted peace. He, Jumper, Alligator, and others said they never meant to sign away their land, but only agreed to send some men to look over the new country before they decided what to do. The meeting became very excited, and at last Osceola sprang to his feet and defied the agent, saying in a taunting manner, "Neither I nor my warriors care if we never receive another dollar from the Great Father." The agent, spreading the treaty upon the table, remonstrated with Osceola, but the fierce chief drew his long knife from its sheath and cried: "The only treaty I will execute is with this," and he drove the knife through and through the paper into the table. Soon after this Osceola had an interview with Captain Ming of the Coast Survey near Fort King, but he declined every civility and "I will not break bread with a white man." A formal council was arranged, but here Osceola in a threatening manner seized a surveyor's chain and declared in a loud voice, "If you cross my land I will break this chain into as many pieces as there are links in it, and then throw the pieces so far you can never get them together again." 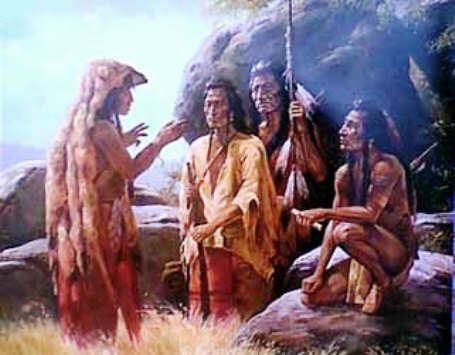 The Indian Agent, in desperation, sent for Osceola and ordered him to sign the papers for transporting the Indians, but he answered, "I will not." When told that General Jackson, the President, would soon teach him better, Osceola replied, "I care no more for Jackson than for you." The Indian Agent knowing that Osceola stirred up his people, had him put in prison at the fort, but he escaped by making promises to his guards. As soon as he was free again he began to get his warriors ready for battle. He went from place to place very fast, hardly stopping for food, till he had a large number of braves gathered near Fort King. Their knives were kept sharp, but sheathed, and rifles were kept on hand with enough powder and balls. Five Indians who went to get food were caught and publicly whipped. Soon after, an Indian was killed; then three white men were wounded and a white mail-carrier killed. The chief, Emaltha, who was friendly to the treaty, was assassinated. The war had begun. It was now 1836 and Osceola was thirty years old. Hearing that Major Dade, with 110 officers and men, was to pass along the military road from Fort Brooke at Tampa Bay, Osceola sent Micanopy and Jumper with 800 of his warriors to wait in ambush for them. It was so well arranged that they whole command except three men were killed. These three men escaped to Tampa and told the terrible story. Osceola had himself remained with a small force near Fort King, for he wished to kill the Indian Agent, his long-time enemy. Lieutenant Smith and the agent were walking quietly toward the sutler's shop, a half mile from the stockade, when a number of Indians set upon them and both were killed. The agent was pierced by fourteen bullets and the lieutenant with five. The sutler and four others were killed, and the store and out-buildings burned. The fire gave the first alarm at the fort. In the meantime, Osceola's warriors under Micanopy and Jumper had been so prompt that the first battle was over before their leader joined them. Then the dreadful war went on. Osceola met General Clinch with 1000 regular soldiers at the crossing of the Withlacoochee River. There were not a thousand Indians, but Osceola brought them into battle like an experienced general. His men followed his own brave example and fought with tiger-like ferocity. Osceola is said to have slain forty of our officers and men with his own hand. The Indians fought till their ammunition was gone, and then with bows and arrows and knives. After this, Osceola went through many battles, but he never despaired and never surrendered till the fearful battle came when the Indians were defeated by General Taylor. Then the waters ran with the blood of Uncle Sam's quarreling children and Osceola's men were scattered to the four winds. Even then Osceola would not have been captured but for an act of treachery. He was asked to come to a conference at a camp not far from St. Augustine. He came with some of his warriors, trusting to the word of the commander, but he and his companions were at once surrounded and carried to St. Augustine as prisoners of war. Our officers said it was right to do this because Osceola had not kept his promises in peace or war, but we do not like to think that the officers and agents of Uncle Sam broke their word, even if an Indian chief did not keep his. Though Osceola fought in the Indian way, and hated the treatment that the white people gave the Indians, still, we know he did not hate the white women and children, and constantly told his warriors to treat women and children with kindness. After he was taken to St. Augustine was in a sad condition. His spirit was broken by defeat and imprisonment, and he grew feeble as he realized there was no escape. When he was taken to Fort Moultrie in Charleston Harbor he knew that he should never see his own land again. Then he refused food, would see no visitors, and died, broken-hearted, after a short illness, aged thirty-three. He was a brave enemy, and respected as he had been by the Indian nation, his manly nature was too proud to be long under the control of the white man. This story of Osceola is featured in the book entitled Famous Indian Chiefs I have Known, by General Oliver Otis Howard, New York, NY, The Century Co. 1916 that was first published in 1908.